English journalist and politician; born April 5, 1855, in London; fifth son of the Rev. Prof. D. W. Marks; educated at University College, London, and at the Athenée Royale, Brussels. At the age of sixteen he went to the United States, where he entered the journalistic field, meeting with varying success. Finally, when his resources were at their lowest ebb, he returned to London (1883), and soon after established the "Financial News." Beginning in a very small way, he made the paper a power in the financial world. 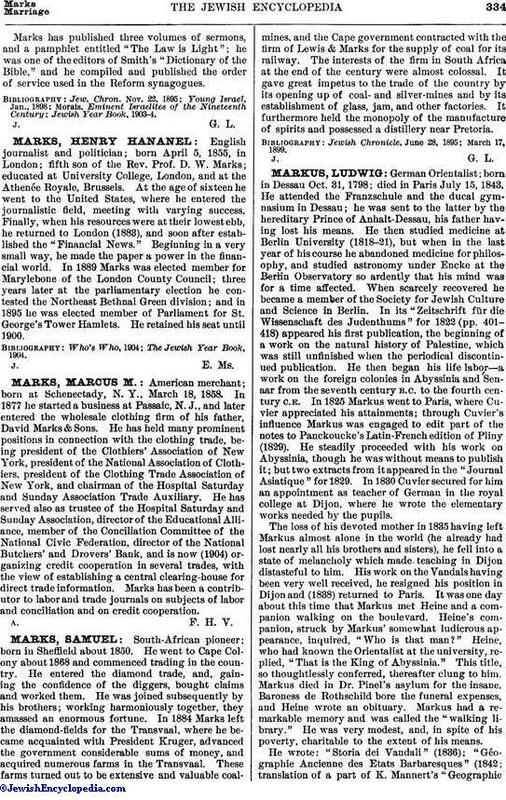 In 1889 Marks was elected member for Marylebone of the London County Council; three years later at the parliamentary election he contested the Northeast Bethnal Green division; and in 1895 he was elected member of Parliament for St. George's Tower Hamlets. He retained his seat until 1900. The Jewish Year Book, 1904.